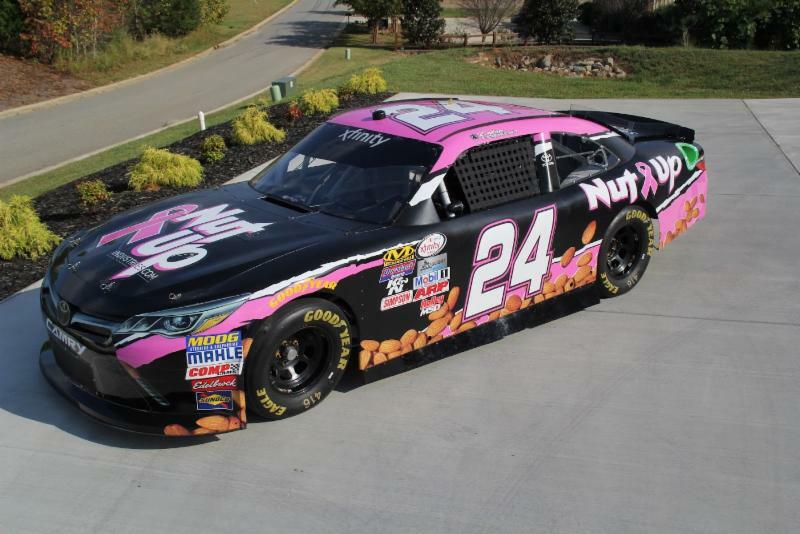 In celebration of Breast Cancer Awareness Month, officials from Nut Up Industries and JGL Racing jointly announced today that NASCAR XFINITY Series (NXS) driver Dylan Lupton will run a special PINK paint scheme in Saturday’s Kansas Lottery 300 at Kansas Speedway on October 21st. Partnering with Susan G. Komen Greater Kansas City, the No. 24 Nut Up Industries Toyota team has pledged to not only support the foundation, but also create exciting opportunities for NASCAR fans to donate and win limited edition prizes. By submitting a $24 donation, each donor will be entered to win over 50 prizes including PINK Kansas 300 race-worn gloves, No. 24 PINK tee-shirts, JGL Racing PINK crew shirts and more. Additionally, each donation made from October 2nd to 17thwill be matched $1-$1 by the No. 24 team and donors will also receive a limited-edition PINK hero card. Live coverage of the Kansas Lottery 300 on Sat., Oct. 21stbegins at 3:00 p.m. (ET) on NBC, the Motor Racing Network and SiriusXM Satellite Radio Channel 90.